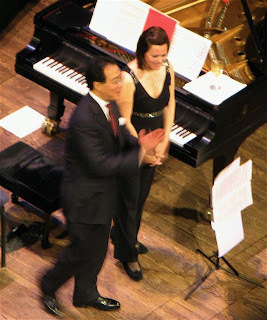 11/9/07, The Schubert Club, Ordway Center: For its 125th birthday, the Schubert Club invited Yo-Yo Ma and Kathryn Stott to play. We bought cheap seats and were astonished to find ourselves in the best possible place for the occasion, overlooking the stage and the piano keyboard. (Gallery Boxes Left, Box A, seats 1 and 3—the left leading edge of the topmost balcony.) Thanks to my new Nikon Trailblazer binoculars, which I brought because I was sure we'd be sitting somewhere in Wisconsin, I could see everything: the unruly cowlick at the back of Ma's head, the sparkles on Stott's shoes, and the back-and-forth between them as they played a beautiful program: Schubert's Sonata in A minor for Arpeggione and Piano, Shostakovich's Sonata in D minor, Piazzola's Le Grand Tango, a collaboration by Eberto Gismonti and Geraldo Carneiro ("Bodas de prata & Quatro cantos"), and Franck's Sonata in A Major for Violin and Piano. At one point during the Schubert Adagio, Ma was reading over Stott's bare shoulder; she turned her head, they looked at each other, and it was a moment of breathtaking intimacy. We watched her graceful hands on the keys, and his on the long fretless road of the fingerboard. At times, Stott's hands seemed lighter than air, as if she was forcing them down to land delicately and skip over the keys and rise again. Which cello was Ma playing? The 1733 Montagnana from Venice named Petunia, worth $2.5 million, which he once left in a New York City taxi? Or the 1712 Davidoff Stradivarius, formerly owned by Jacqueline du Pre? (The Duport Stradivarius, built a year earlier, was owned by Mstislav Rostropovich. The scratch on its side supposedly came from a spur on Napoleon's boot.) Ma calls the Montagnana "my voice," so I'll guess that's the one he had at the Ordway. When you sit close and/or have a decent pair of binoculars, you can see that making music takes sweat and breath and physical effort. Both Ma and Stott worked hard at the Ordway, playing for a sold-out crowd (oversold; we had to borrow a program from someone seated near us), cheerfully returning for four encores, raising oversized wine and martini glasses in a mock toast, and reappearing in the foyer, where the audience had been invited for champagne and birthday cake. The music there was provided by pianist Laura Caviani, tenor sax player Pete Whitman, and bassist Gary Raynor. A friend later told me that the always gracious Ma told the crowd he'd been the opening act for Laura and her trio. Stealth photo by an anonymous photographer. Wow! Sounds fabulous. We've always thought those were the best seats, but we've never managed to get them! Hmph.